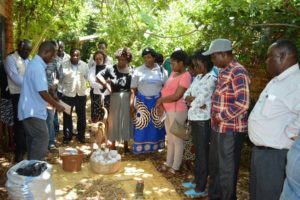 Earlier this month we had a visit to Never Ending Food from a group of Agriculture Extension workers from the Lilongwe District. Despite this year’s challenges of drought and armyworms, the extension workers were able to see the benefits and resilience of good Permaculture Design in the face of adversity. 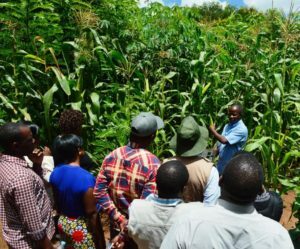 One of the problems with many agricultural programmes in Malawi is that they often advocate for a ‘cookie cutter’ approach in which a one-size-fits-all approach to monocropping maize is supposed to work the same way throughout the country. This leaves very little room for flexibility in the designing of unique and sustainable systems, Permaculture allows individuals and communities to choose locally-appropriate and diverse resources to meet specific needs of nutrition, income generation, variations in rainfall patterns, soil conditions, and even cultural likes and dislikes. 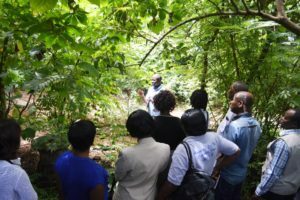 Often times, when government programmes promote crop diversity, they are often speaking only of a handful of crops (predominantly staple-food crops), such as maize, cassava, and sweet potatoes. Here at Never Ending Food, we were able to show the extension workers an abundance of diversity which includes over 200 different foods. This year, Malawi’s Nation Newspaper is already reporting that an estimated 1.9 million Malawian families will be facing hunger due to crop failure. During the extension worker’s visit, they were able to see practical and successful solutions in action. We were able to demonstrate many solutions to the current challenges which are faced by agricultural extension workers while working with local communities. Many complain about the high cost of commercialized seeds, but we were able to show systems based entirely upon the use of locally-sourced, open-pollinated, and free seeds. Instead of relying on government-subsidized fertilizer programmes, we were able to demonstrate 100% organic methods of rebuilding soil fertility (e.g. composting, mulching, liquid manure, vermiculture, composting toilets, agroforestry, etc). While many Malawians face chronic ‘hungry seasons’ and malnutrition, we were able to walk the group through an edible ‘Garden of Eden’ with daily access to all of Malawi’s 6 food-groups on a daily basis. We were also able to showcase sustainable technologies such as fuel-efficient stoves, hand-made paper briquettes, water harvesting, solar drying, propagation techniques, integrated pest management, and diversified income generating ideas. Hopefully, the extension workers were able to see that their work is vital to the creation of a sustainable future here in Malawi and that all of the solutions we’ve ever needed have been sitting right in front of us–often being ignored and over-looked. Agroecology for the 21st Century Conference! Get 20% more food from your ‘Zone 3’! International Students learn about Sustainable Design! © 2019 Never Ending Food. All Rights Reserved.